After another deadlock or tied votes from the judges occurred this night. 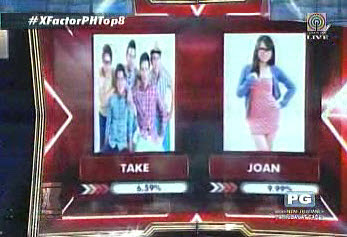 Take Off and Joan Da were the bottom two on this week's performance. They were judged based on the public's votes. On the recent elimination night, it was Take Off who was voted out! For their survival song, Take Off sang Ogie Alcasid’s “Sa Kanya” for the third time while Joan Da sang “Grenade” by Bruno Mars. 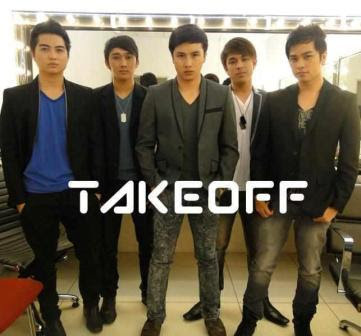 Take Off got the lowest number of votes, 6.59% against Joan Da‘s 9.9% which led them to bid farewell in the competition! This night's deadlock happened when Pilita Corales and Charice Pempengco voted off Take Off, while Gary Valenciano and Martin Nievera voted off Joan Da!